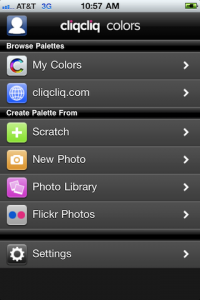 Cliqcliq’s Colors is a handy app for creating color palettes. I like how they’ve customized the table view with simple but effective graphics. 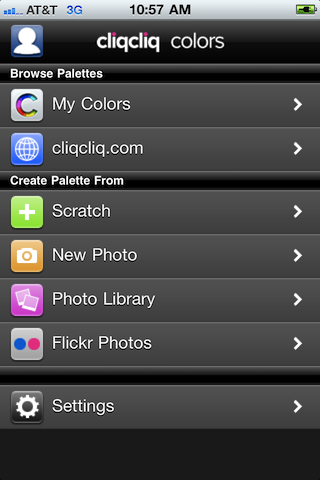 This is the main screen of the app, and seems to be based on a standard UITableView. Everything under the header bar scrolls, just like you’d expect. They have simply set the cell backgrounds to simple gradient, and added nice looking icons for a dash of color. Not a lot of work but it’s nice polish. Here is their settings page. Oddly enough this page doesn’t scroll, it’s probably just a simple UIView. It has a nice clean look, with simple gradients. The text for the switches is legible & easy to understand. 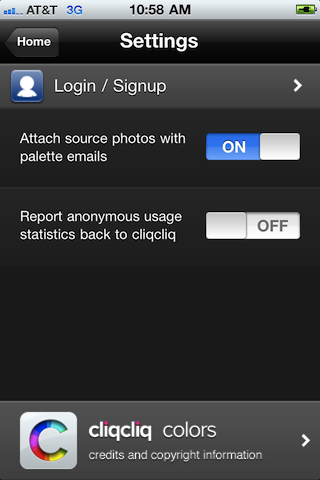 A minor ding for the highlighting on Login/Signup is a little strange looking, like a group header that wants to be on a UITableView.